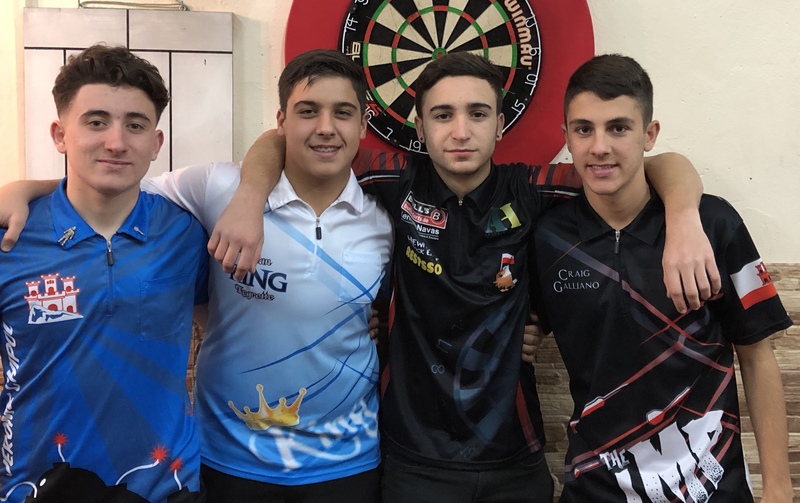 The second Youth Ranking event of the 2018/19 season took place on Wednesday 23rd January. Once again it was a brilliant night of darts as these youngsters continue to produce darts of the highest quality. The race for Qualification for the 2019 European Youth Cup started in November and now we are two events into the season. 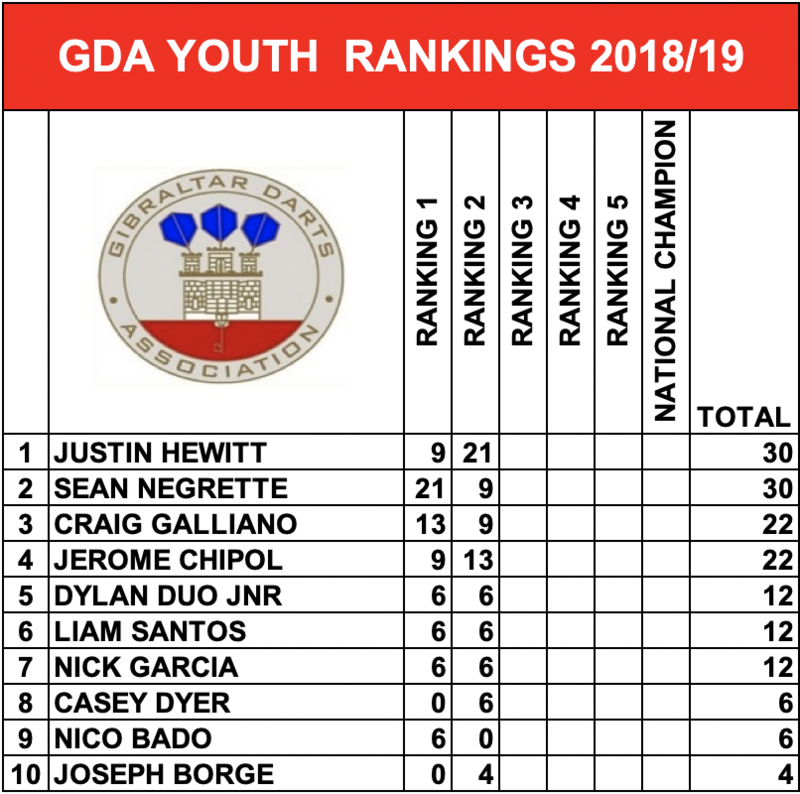 At the end of the season the top 4 players in the rankings will be the ones who earn a spot to represent Gibraltar at this prestigious event. The next event (Ranking No.3) is scheduled to take place on Wednesday 13th February. Here is a round-up from the Quarter-Final stage onwards..
As expected the four seeded players came through their respective matches with relative ease. Craig Galliano defeated Casey Dyer 4-0, Jerome Chipol defeated Nick Garcia 4-0, Sean Negrette defeated Liam Santos 4-0 and Justin Hewitt defeated Dylan Duo Jnr 4-1. Both Semi-Finals were a repeat of the last ranking, Craig played Jerome and Justin played Sean. In the first Semi-Final match Jerome Chipol produced the shock result of the night as he defeated Craig Galliano 4-2. Craig defeated Jerome 4-1 in the previous ranking but this time round it was Jerome who managed to get revenge over Craig, Jerome did show signs of improvement last time and this time it definitely showed. In the second Semi-Final game Justin Hewitt defeated his doubles partner Sean Negrette 4-0. The game was a brilliant watch with both players scoring heavily throughout. Unfortunately for Sean he missed several darts at doubles and Justin was not missing much and was quick to punish Sean’s misses. The final was a brilliant match with both players putting on a great show. Justin wins the bull and starts the game. Leg 1 – Justin held his throw with a 62 finish on D16, 1-0. Leg 4 – Justin checks out a brilliant 61 finish (25,D18 in two darts) to win the match and take the title, 4-0. Jeremy Cruz caught up with Justin Hewitt for an interview after the final..
Firstly, congratulations on your victory Justin, you must be happy to win your first title of the season? You defeated your doubles partner Sean Negrette 4-0 in the Semi’s and then Jerome Chipol 4-0 in the Final, you won both these games with relative ease, did you expect these games to be tighter? Last season you only managed to win one ranking title out of six. However, you did make five finals in a row which was really impressive. Are you confident you can do even better this season and win more titles? This year will be your final year as a youth player and undoubtedly you main goal is to qualify for the 2019 European Your Cup, are you confident you will make it into the top 4 and qualify? This season you have once again joined the Super League which is a Senior event. Do you think playing with the adults and playing with a bigger format has helped improve your game? Finally Justin, last season you finished third in the Youth Rankings, third in the Youth League and eleventh in the Senior Rankings. What are your targets for this season? Here are the Top 10 in the Rankings after two events played..